Tactus Therapy Solutions has tons of great applications for working with clients who have aphasia. However, many of their applications have a "child-friendly mode" so that you can use them with your child clients! 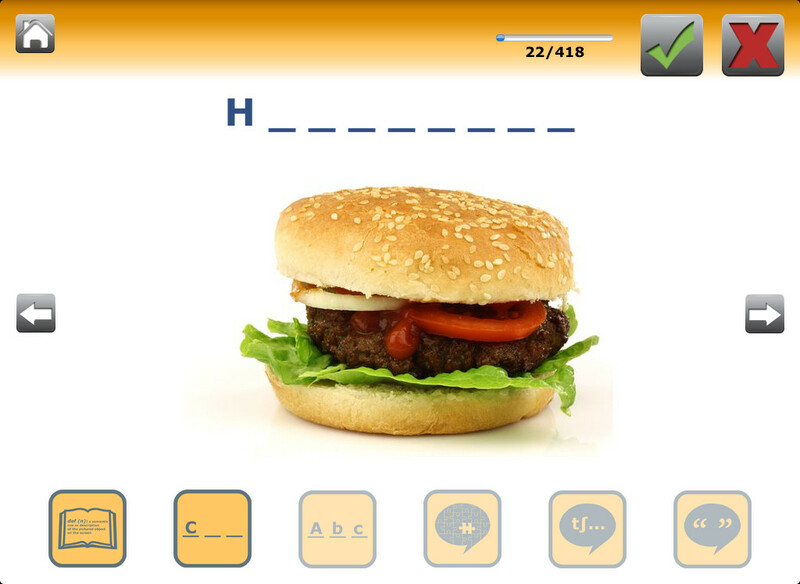 There are many ways to adapt this application for speech-language therapy in the schools, so continue reading for my review and a giveaway of Naming TherAppy! The main page of the application includes four different activity choices for application play as well as an information button and settings button. This page gives instructions on how to use the application, the intended therapy population to use it with, how to use the settings, who developed the application, social media links, e-mail and website links, a link to view other Tactus Therapy Solutions apps, and a disclaimer. Maximum Number of Trials - choose between 10, 25, 50, 100, or all of the trials. Default E-mail Address for Results - This allows results to be sent to the e-mail typed in this box. Child-Friendly Mode - Toggle on/off switch; turn on to remove items referencing alcohol or violence. Naming Practice - First, choose categories to appear during application play from 10 different categories with 12-122 items within each. Press the check marks next to the categories to select them. You can select or deselect all as well. Press the arrow button to advance to the next portion of appilcation play. An image will appear on the screen to name. Press the green "+" button if the user names the item correctly or the "x" button if incorrect. You can have the definition stated, the first letter with blanks for the remainder of the word, the word spelled out, a carrier phrase stated, the first letter sound stated, or the whole word stated as a cue. Even if the person answers correctly after a cue, count it as correct as the application will store data on the amount of cues given. 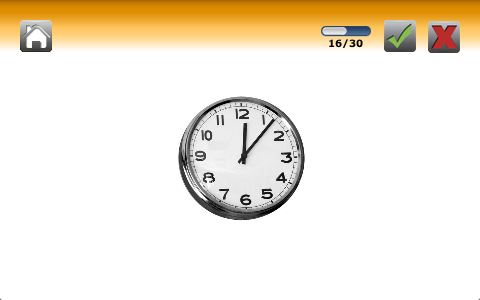 Press the "Home" button or wait for the pictures to run out to end application play. A "Results" page will appear showing how many items were correct with and without the type of cue. You can have the client try again, e-mail the results, or be finished with the application. Describe - Once again, choose a category/categories to play. Press the next arrow to advance. Have clients describe each image using visual and audio cues such as an eyeball for "what does it look like", a chart for "what type of thing is it", a molecule for "what is it made of", a compass for "where do you find it", gears for "what is it used for", shapes for "what shape is it", an ampersand for "what does it go with", a nose for "what does it smell like", an ear for "what does it sound like", a compass for "when do you use it", a tongue for "what does it taste like", and a hand for "what does it feel like". These strategies will help a person with word retrieval. Naming Test - This is a 30 item (fixed) test with items appearing in order of increasing word frequency. For each picture, a person must say its name. For correct answers, press the green checkmark. Press the red "x" for incorrect answers. Once the test is done, results will appear with a breakdown of each category. A person can try again or you can e-mail results. Use these for drill on naming items, asking questions, asking for a gesture, or any other goal. 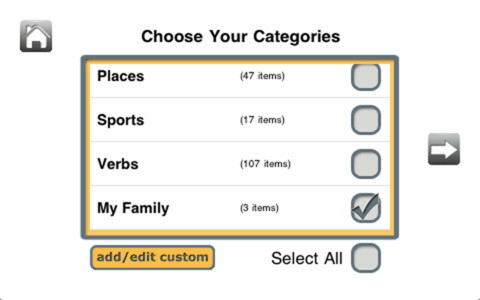 Select a category/categories to practice and pictures will appear in random order. Press the arrow keys to navigate between images. Press the pictures to hear the word. Press the "Add/Edit Custom" button at the end of the screen to create or edit a custom category. Press "Add New Category", then type the category into the white box at the top. Then, press the "Add New Item" button to add an image and word to the category. Type in the name of the item, then add a sound/narration associated with the item. Next, choose a photo or take a new one associated with the text. After that, press "Done" to add it to your board. The category will appear on the "Choose Your Categories" page to play. If you wish to edit a category or item in a category, select the one to be edited. Then, press on an item to edit it or press the "Delete" circle button to delete an item. Press the "Delete All" button to delete all items. There are four different naming activities within this application. 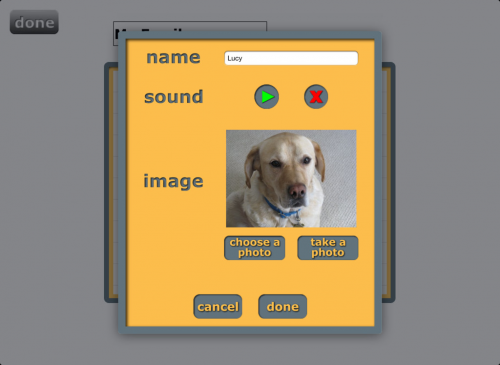 Images are pre-loaded for all activities and you can use your own images to create custom flashcards! There is the ability to record audio for custom flashcards. The visual and verbal cues in each of the Naming Practice and Describe activities are perfect to use with people who have aphasia or word-finding difficulties! The Naming Test serves as a good informal baseline for therapy. You can use the application with both adults and children depending on whether you turn "Child-Friendly Mode" on or off. You can adjust the number of trials depending on the length of the session. The fact that the application creates a report to e-mail saves time for the clinician. The application is clean, easy to read, and the images are clear. I would definitely love more information on how the items and the amount of items were selected for the "Naming Test" (just curious). I would love user profiles; however, I am not sure how that would work with HIPAA compliance. Maybe something with a password? It would be great to see the items/a list of the items included on a list prior to application play (maybe even to be able to choose the items for practice from that list). 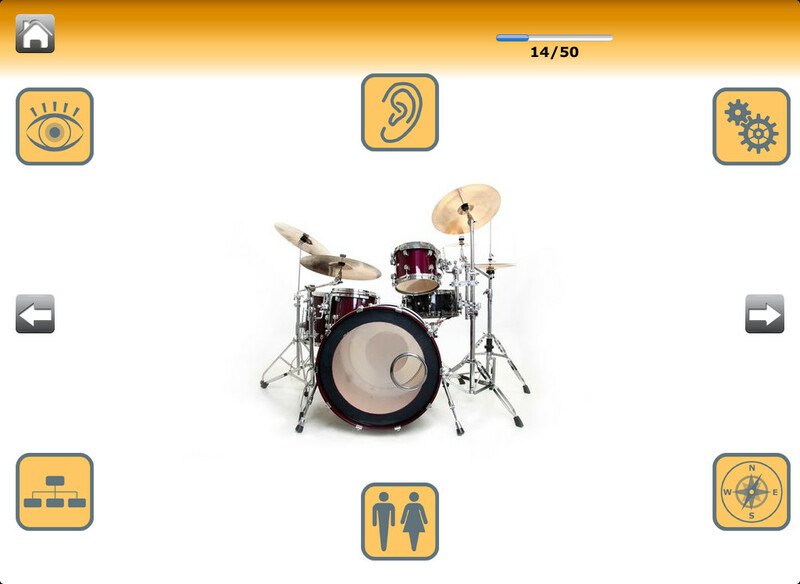 Aphasia - This application is primarily for people who have word-finding difficulties due to stroke/brain injury/aphasia; use the application to help adolescents and adults with aphasia name various objects and be better able to retrieve words faster using strategies. Receptive Language - Choose a category and have students learn about the various vocabulary within the category. See if students can name more items within a category. Use the "Describe" portion of the application to help the student learn strategies to describe various objects. Use the "Naming Practice" portion of the application to help students use various word-finding strategies. Expressive Language - Have students create a sentence or story about the picture. Social Communication - Have children discuss their favorite foods, clothing, etc. within a category. Children can discuss certain concepts as well such as pollution, health, and more. 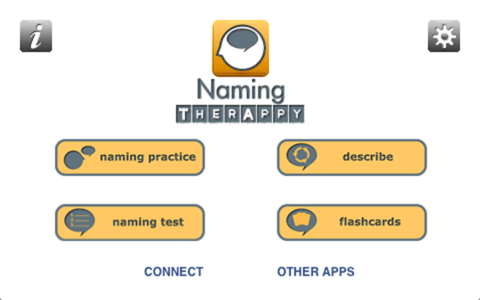 Naming TherAppy is available for the iPod Touch, iPhone, and iPad for $24.99. Naming TherAppy is also part of Language TherAppy and you can trial Naming TherAppy by downloading Language TherAppy Lite for free for the iPod Touch, iPhone, and iPad. 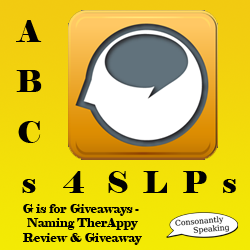 Consonantly Speaking was given a copy of Naming TherAppy to give away with this review. No other form of compensation was given. Enter the giveaway below for your chance to win a copy of Naming TherAppy!